Sun Yat-sen (Sun Zhongshan), the great forerunner of the democratic revolution of China, "Father of Modern China," was born on 12 November, 1886. 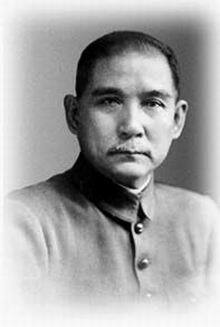 He was a doctor, political leader, a uniting figure in post-Imperial China and had great influnce in China's history. As the foremost pioneer of Nationalist China and a uniting figure in post-Imperial China, Sun is frequently referred to as the Founding Father of the Republican China, a view agreed upon by both the People's Republic of China and the Republic of China (Taiwan). On the mainland, Sun is also seen as a Chinese nationalist and is highly regarded as the Forerunner of the Revolution. In most major Chinese cities, one of the main streets is named Zhongshanlu to memorialize him. There are also numerous schools, parks, and geographical features named after him. His massive portrait continues to appear in Tiananmen Square for China's National Day. Sun played an instrumental role in inspiring the overthrow of the Qing Dynasty, the last imperial dynasty of China. 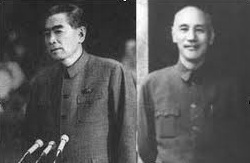 Sun was elected as the first provisional president of the Republic of China (ROC) after the Xinhai revolution. Sun Zhongshan's Portrait in the Tiananmen Square. It is 6-meter tall and weighs 2 tons. After the success of the revolution, he quickly fell out of power in the newly founded Republic of China, and led successive revolutionary governments as a challenge to the warlords who controlled much of the nation. 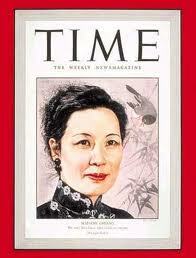 Picture at left: Song Qingling, Wife of Sun Zhongshan, appeared on Time magazine. He also co-founded the Chinese National People's Party or Kuomintang (KMT, Guomindang) and served as its first leader. Although Sun is considered one of the greatest leaders of modern China, his political life was one of constant struggle and frequent exile. His chief legacy resides in his political philosophy that was known as the Three Principles of the People: nationalism, democracy, and the people's livelihood. Sun did not live to see his party consolidate its power over the country. Actually, his party split into two factions after his death in 1925. Because he was widely revered in both mainland China and Taiwan, his influence was not only pronounced in China's politics, but also on China's Fashion, though the later fact seems to be not widely known yet in the Western world. You might know what is a "Mao suit"or "Mao tunic." The tunic suit had dominated Chinese fashion for many years, and its name was a mistake. It was Sun Yat-sen, not Mao Zedong, who should be connected with the style. Because Dr. Sun Yat-sen is better known among the Chinese as Sun Zhongshan, Chinese people called the suit "Zhongshan Zhuang" or "Zhongshan suit". It was a tradition in China's history to change the styles of the people's clothes whenever a new dynasty replaced an old one. The 1911 Xinhai Revolution overthrew the Qing Dynasty and founded the Republic of China. Members of his Nationalist Party proposed to change the national costume. During the discussions, Dr. Sun favoured the casual dress prevalent in Guangdong Province but proposed certain modifications. A designer worked on his ideas and produced the tunic with four pockets and a turned-down collar, closed down the middle with five buttons. It looked simple and tasteful and gave an air of sedateness. From then on Dr. Sun set a personal example by wearing the tunic suit on various occasions. It did not take long before the style became fashionable all over the country.